bibbly-o-tek » Blog Archive » Scritti heads to Germany: Party like it is 1979! Scritti heads to Germany: Party like it is 1979! 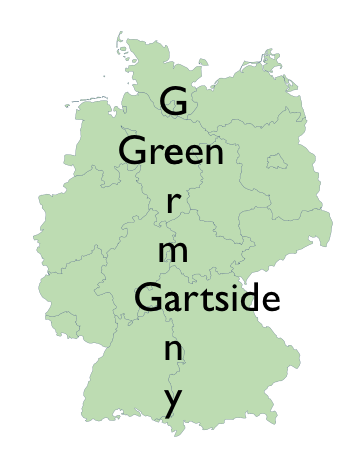 So I tracked back to the fact that Scritti hasn’t played Germany since 1979. April 9th to be exact. We have this listed in our Gigography section. I don’t have it memorized so I had to look it up. I found that they played here with Red Crayola. (Now known as Red Krayola.) Did you know they are from Texas? I didn’t. Who knew? They toured with Scritti back in the day. And they are still active. The poster has been around and on the internet for a long time. Bibbly-o-tek.com visitor Roger Homes says that the gig was to play at Ratinger Hof in Düsseldorf , but was moved to the Okie Dokie in Neuss, a suburb of Düsseldorf. The Okie Dokie is still operating today. I suggest the band get a hold of them and see if they can add December 1st date at the Okie Dokie. It is only a short drive from Cologne, the last scheduled gig in Germany. If that happened, it could be truly epic! After further review (American football fans will get the aformentioned reference) Scritti also played in Berlin in 1979. This was NOT in our gigography, so I thought I would mention it here. 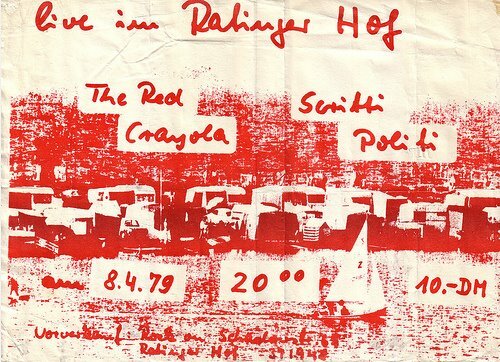 I found from this link that they played S036, a legendary venue in Kreuzberg’s Oranienstraße with Red Crayola as well. They played there on April 7th if that link is accurate. If you are in Germany towards the end of this month, be sure to get tickets and see Scritti play live. If that doesn’t work for you, then try some of the UK dates in December. Or, pray for a 2006-esque miracle and hope they play North America again sometime soon. By the way Strohmeyer is German for Straw Tax Collector. I remember seeing an interview (probably around the time of Anomie and Bonhomie) with Green where the interviewer relayed some critical comment and compared Scritti unfavourably to bands like the Red Crayola. Green responded by claiming never to have heard of the Red Crayola! This despite having gigged with them, and despite Mayo Thompson of the band producing much of Rough Trade’s output between 1978 and 1982! Even at the time, I thought “well you claim your memory’s bad, but I really don’t think it can be that bad.” It’s a long shot, but can anyone direct me to this interview? I’ve scoured YouTube, and can’t find it, but would love to see it again? I don’t recall anything about Green denying knowing about them. Doesn’t mean there isn’t an interview out there that he might have. However the link below from 2006 Green mentions Red Crayola…..
You’re right John, there’s plenty of (recent) interviews where he’ll play up his association with the Rough Trade scene and mention the Red Crayola etc., but I think he’s a lot happier to admit this nowadays. There was a time, though, (1984-2002 or so) when he was trying to turn his back on that sort of thing, and seemed embarrassed by his early work, and it was then that I saw this interview. And as I said, even at the time I thought he was being economical with the truth. Something happened to Green between 1999 and 2006. I think he aged and matured and mellowed. He hated talking about the past and always wanted to look forward and he made a point of doing so. Not only did he start playing live, he also decided to play older tunes as well. Plus he finally got married. Somewhere in that time was a huge turning point in Green’s life. He has some of his old patterns, but they aren’t as rigged as they once were.